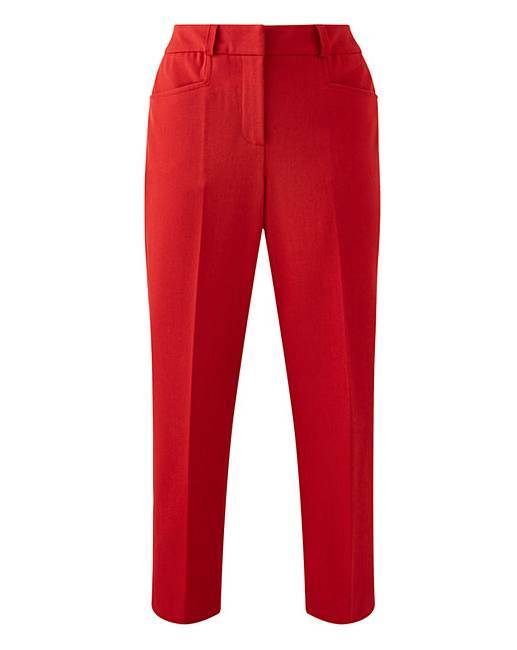 Deep Red Meghan Cigarette Trousers is rated 4.3 out of 5 by 43. Also available in (CR112) Black, (CR136) Cobalt, (CR137) Navy, (CR135) Dark Green. 62% Polyester, 33% Viscose, 5% Elastane. Inner Panel: 83% Polyamide, 17% Elastane. Rated 5 out of 5 by Jurb from Great trousers Got these a few weeks ago. They are a fab fit and very comfortable. Rated 5 out of 5 by Libby232 from Lovely fabric, Wears and washes well. Fabric is good quality. I've purchased these trousers in every colour now as they are super comfortable and look nice for work. Rated 5 out of 5 by Christy from Stay smart with Meghan' I bought these trousers about a month ago. They are an excellent fit and very comfortable to wear. The material is strong and keeps the shape of the garment. The price was very reasonable and I would buy similar trousers again. Rated 5 out of 5 by jeanibe from Nice trousers Comfy fit and good quality. True to size. Love them. Rated 5 out of 5 by Queen Wobber from Perfect Absolutley love these, as a shorter person they are a little longer but so comfortable for work. I wear with flats or different ankle boots. Just ordered different colours now ti fill my wardrobe! Rated 4 out of 5 by classy lady from Great fit I bought these after reading other reviews. Very pleased with them, great fit and a lovely length. Rated 5 out of 5 by Magicmag from Great trousers Bought these for a birthday night out with friends I had so many compliments.they fit really well and look like they cost a lot more the comment made my birthday even more enjoyable . Rated 4 out of 5 by Wiggle1 from Lovely and comfortable These are lovely trousers, I bought them in cobalt blue and red. The fabric is quite heavy which is good for spring and autumn. The only thing I would say is that the red ones are actually a russet/orange colour, definitely not red.